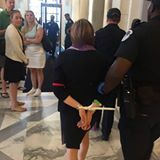 On July 11th, I was arrested as an act of moral obedience, a day after the 200th birthday of Thoreau that rebel who dared to reimagine the power of civil disobedience in the context of abolition and war-mongering. As a Unitarian Universalist minister, I've served in parish ministry for seven years, but before that ministry I served as a hospital chaplain. Health care is a fundamental human right. My faith is clear-to care for the body of a human to ensure that they can live is a fundamental moral obligation in a just society and a moral obligation commanded by our constitution. Some things are complex - string theory and just war theory. This is simple: we have a moral imperative. Eroding and eradicating Medicaid is denying life to 22 million Americans. It may be done in the back room bargains of congressional offices instead of under the bright lights of an emergency room, but anyone who supports this -who supports the idea that care of the body is a privilege-has blood on their hands. On my way here, I was stopped at the train station by a woman, Darlene, who asked me to pray for her because she is having back surgery to alleviate extraordinary pain. I'm here praying with my body and faithful witness that the only worry upon Darlene and millions of Americans will be recovery and healing not whether they have been deemed worthy by this congress to receive care. No one deserves to die because they couldn't afford medical care.